Any large and apparently spontaneous activist event can force a measure of change within a system (depending on longevity), but the problem is always how that movement is being directed. Is it a legitimate grass roots effort, or is there something else at play? I am reserving judgement on the "Yellow Jackets" for now, and simply watching. When they start engaging in public relations regularly, they will present terms, and also probably present their vision of France's future. There will also be politicians that attach themselves to the movement if the movement achieves some success, as they seem poised to do. Then, we will know who is involved, and if the movement is controlled opposition or a real front against centralization. Also keep in mind that the globalists may be seeking to give such "populist" movements room to grow, because they plan on collapsing the system anyway and blaming the whole mess on decentralization activists. I certainly hope this is a win for the people of France, but I would never underestimate the 4th Generation warfare of the establishment. The gilets jaunes (Yellow Jacket) anti-tax riots in France escalated over the past weekend, again citing the impact of higher taxes on fossil fuels – and high levels of taxation in general – on everyday life. 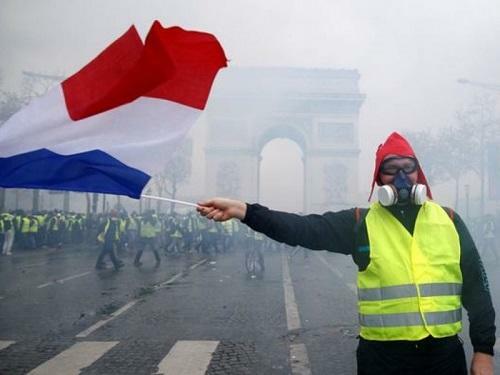 French citizens, already subject to the highest taxes in the OECD, are being crushed by both new and systematically increasing taxes, and have taken to the streets by the hundreds of thousands in a “citizen’s revolution”. Recommendations to declare a state of emergency have for the time being been tabled. Yet violence is the core component of his chosen vocation as a statesman. Taxation poses as an equitable transaction – goods and services provided by a government in return for a fee (more galling and Orwellian, a “contribution”) from the taxpayer – but the nature of the interaction is obvious to all but the indifferent or determinedly thoughtless. It is not voluntary and does not follow from reason; neither will even the most indefatigable defenders of state appropriation, given the choice (and confidentiality), miss an opportunity to skirt the taxman and retain their property. The force of violent compulsion is the quintessence of taxation and tax policy, thinly ensconced behind a veil of platitudes regarding social goods and general welfare. In Paris, an oft-repeated phrase among the protesters is that they’re “fed up.” Ambulance drivers have joined the protests, as have both teachers and students in at least 100 schools across France. Levying taxes on individuals to combat climate change – or for the accomplishment of any social betterment project – is unfailingly undertaken in the name of the sanctity of life. Yet if life is an invaluable state and condition, so too is that of the right of personal property. A life absent the ability to enjoy the products of our toil by utilizing them directly or voluntarily exchanging them with that of others is a life circumscribed, and thus a life forcibly, purposely denigrated in quality. Media images depicting the tax insurrection are dominated by burning cars, graffiti on the Arc de Triomphe, and clashes with police – despite the fact that the majority of the 136,000 protestors on Saturday were disruptive but peaceful. Yet none should doubt the long-seething precursor to this conflagration despite the impossibility of capturing winnowed domestic budgets and severe fiscal hardship on film. Furor arising over a life circumscribed by bad luck or adverse conditions is considerable; that which results from unquestionable bureaucratic decrees is ultimately incendiary. The public reaction to the incremental repression of life’s expression by state coercion at a certain point becomes immediate and visceral. It is playing itself out in the streets of Paris right now. Consider the larger stakes here. For more than 100 years, European governments have built their invasive states, with the public sector controlling ever more of life. The promise of combining security and prosperity through state enhancement has failed to achieve its promise. And what does the political class propose? More government power, this time in the name of green energy. At some point, it is too much. Just as the citizens suffering under Soviet rule finally said no more, the people suffering under social-democratic rule might someday do the same. Observers have waited decades to see reforms that might forestall such a thing. Reforms haven’t happened. Now the people are in the streets, setting fires and protesting the police. And it’s not just France. It’s spreading to Belgium and the Netherlands – the building of a European Spring. What we see in Paris today might be the end of social democracy as we know it. What comes in its place is what the battle of ideas today is really about.